Nothing says "Christmas" like a beautiful velvet bow on a green wreath. Traditionally made of red velvet, the bow can be any color that coordinates with your holiday decorating-scheme, so long as it is large and lush. The following directions will let you make a bow that truly says "Merry Christmas." Cut a 2-foot length off your 3 yards of wide ribbon. Notch the ends or cut them at a slant. Set it aside. Make loops with remainder of wide ribbon, allowing 1 ft to complete each loop and holding loops together at the center. If your ribbon is velvet on one side and smooth on the other, twist the ribbon as you complete each loop so that each loop has velvet on the outside. Add the notched length of wide ribbon to looped bow. Secure it all with a twist of florist wire. Spread loops out, to make a full bow in an oval-to-round shape. Cover florist wire with narrow ribbon and knot it at the back of the bow. 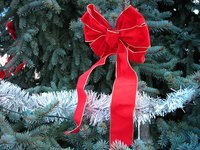 Use extra narrow ribbon and florist wire to secure bow to wreath. For an even more elegant bow, experiment with mixing widths, textures and colors of ribbon as you make the bow. So long as loops are all roughly the same size, the effect can be as dramatic as you like.